1) Soft shell crab from Chespeake Bay, king crab from Alaska, Dungeness crab from the Pacific Northwest, and Jonah crab from New England. Each North American crab species has its own delicious and appealing characteristics, and Turners Seafood Grill & Market celebrates them all with an annual, month-long Crab Fest. A dozen crab recipes will be served at lunch and dinner from June 1 through June 30 inclusive. 2) On June 14, at 6pm, Legal Harborside will team up with Sommelier Journal to host the “Antinori Sommelier Challenge” on the second level of Legal Sea Foods’ flagship location. After a welcome reception featuring outstanding wines from Antinori Winery and passed hors d’oeuvres, guests will be treated to a three-plus-course dinner with two Antinori wine pairings per course as chosen by the two competing sommeliers. The winning sommelier will advance to the next round of the “Antinori Sommelier Challenge” with a chance to win the grand prize: a cash award and a trip to Austria sponsored by Austrian Wine. Event attendees will also receive a complimentary one-year subscription to Sommelier Journal. 3) On Sunday, June 17, from 11am-10pm, treat Dad to a Father’s Day lunch or dinner at Blue on Highland and he’ll receive a gift certificate for a free round of golf at the New England Country Club, Massachusetts’s premier golf course located in Bellingham. Blue on Highland will be offering its brunch menu featuring live jazz, and early morning classics such as Sirloin and Eggs with brioche bread, mushroom truffle-butter and home fries ($14), or mid-day fare such as Margherita pizza with fresh tomato, basil and mozzarella ($9) or The famous Blue Burger nestled in a soft kaiser roll, served with tomatoes, onions, pickles and a choice of Swiss, American, mozzarella or cheddar cheese ($13). If Dad is sleeping in, treat him to a beer and steak dinner at Blue on Highland, served from 3pm-10pm. The gift certificate for a free round of golf does not expire and is valid Friday through Sunday after 12pm (including holidays), and Monday through Thursday at any time. Certificate is valid for one person only and does not include a golf cart. Rant: Where Is Wine Made? Is wine made in the vineyard or the cellar? On our first winery visit in the Chianti Classico region, we met Alessandro Gallo, the Direttore of Castello D'Albola, He spoke about the significant increase in the quality of Chianti Classico wines in the last fifteen years or so. That change is due to numerous factors but Alessandro had his own idea about what was the most significant change that led to the increased quality, a change of a particular mindset. He claimed that many wine makers once believed that wine was made in the cellars, but they have now come to believe that wine is made in the vineyards. This belief is held by other wine makers across the world, yet some still cling to the former belief, that wine is mainly made in the cellar. It is obvious that both contribute to the creation of a wine, yet some will give higher priority to one over the other. It seems to be my experience that those who believe it is made in the vineyard do produce better wines. There are certainly exceptions but it seems to hold true as a general rule, in wine regions across the globe. Why is this the case? Well, if you start with excellent ingredients, then your final product stands a better chance of being superior. So, if you have excellent grapes, it becomes much easier to make an excellent wine. If you feel that wine is made in the cellar, you may not pay as much attention to the ingredients, the grapes, and thus not worry as much about your vineyard. So, if you have a lesser quality ingredient, your product may not turn out as well. And if you try to make it so, you might have to manipulate it a great deal in the cellar. Thus, the Chianti Classico producers shifted their attention back to the vineyards, back to the essential ingredients, and found it easier to make a quality wine from quality grapes. That should be a lesson to other wine producers, a reason for them to adopt a new paradigm and concern themselves much more with their vineyards rather than the cellar. Both are essential, but the new paradigm offers advantages which often lead to superior wines. 1) The 5th Annual Strawberry Dessert Festival will be held from June 1 – July 1 at 40+ area restaurants around Boston, and will feature special strawberry desserts, a portion of the proceeds for which will benefit Mass Farmers Markets. Desserts being offered range from strawberry shortcake to a strawberry rhubarb float at Upstairs on the Square to a roasted homemade strawberry ice cream sandwich at Ashmont Grill. The Mass Farmers Markets Strawberry Dessert Festival was established in 2008 to highlight the local strawberry season and to raise much-needed funds for the mission of Mass Farmers Markets as the only state-wide non-profit dedicated to sustaining and strengthening our farmers market system. Some of the participating restaurants include: Armsby Abbey (Worcester), The Beehive (Boston), Bistro 5 (Medford), Blue on Highland (Needham), Flora (Arlington), Haley House Bakery Café (Dudley Sq, Boston), Henrietta's Table (Cambridge), Highland Kitchen (Somerville), Oleana (Cambridge), Sofra Bakery & Café (Cambridge), Tomasso Trattoria (Southborough), Watch City Brewing Co. (Waltham), Vicki Lee’s (Belmont), Upstairs on the Square (Cambridge), Deuxave (Boston) and Ashmont Grill (Dorchester). 2) Join Chef Erwin Ramos of the Ole Restaurant Group (Olé Mexican Grill, Zócalo Cocina Mexicana, Olecito and andalé) as he takes you on a journey through the various regional cuisines of Mexico with some of Mexico’s best chefs. “I’m so excited to be hosting these truly talented chefs in our restaurants,” said Ramos, who has arranged to fly and host chefs Fany Gerson, Ana Elena Martinez and Pilar Cabrero to the Boston area this summer. The series will be held on the last Sunday of each month at 6pm from May through July. 2012. Gerson and Ramos will present a 4-course dinner highlighting the cuisine of Mexico City where Gerson was born and raised. A graduate of the Culinary Institute of America, Gerson has worked in kitchens worldwide, including Michelin-three-star Akelare in Spain, Eleven Madison Park, and Rosa Mexicano in New York, and is the author of My Sweet Mexico and Paletas: Authentic Recipes for Mexican Ice Pops, Aguas Frescas & Shaved Ice. While the savory will be served, be ready for some sweet treats at meals end. Gerson now runs La Newyorkina, that focuses on Mexican sweets. June 24, 6pm: Chef Ramos will co-host a very special dinner with Chef Ana Elena Martinez of Culinary Adventures from Puebla, Mexico with the focus being on Poblano cuisine. Poblano cuisine is the evolutionary combination of the traditional indigenous fare and the influence of the 16th century Spanish nuns, who created such items as chiles en nogada, mole poblano, and numerous sweets. Guests of this dinner can expect to see things such as fresh ground tortillas and vibrant, fresh salsas and moles integrated into these various dishes. This dinner will be held at Olé Mexican Grill in Cambridge. July 29, 6pm: Chef Ramos will co-host Chef Pilar Cabrero from La Olla Restaurant in Oaxaca, Chef Pilar Cabrero is the gold standard when it comes to true Oaxacan cusine. It’s been said that Oaxaca is to Mexican food lovers and cooks perhaps what Florence is to art aficionados. Those interested in taking a true culinary journey that will span the vibrant rich and spicy, to the rich smokey and often complex flavors of Oaxaca will love this dinner. This dinner will be held at Olé Mexican Grill in Cambridge, MA. Chef Ramos and all guest chefs will be making table visits and will address the groups to discuss what is on menu and will be more than happy to meet and greet as well as answer questions guests might have. Donations will be accepted the evening of the event for our sponsored charity, the Corazon de Vida Foundation. The Corazon de Vida Foundation (CDV) founded in 1994, provides life-sustaining support to children living in 15 orphanages in Baja, Mexico. For Reservations, please call (617) 492-4495. Cost: $40 per person, + tax and gratuity. Drinks additional. Prix fixe menu. (1) Seating only. 3) For Father's Day, on Sunday, June 17, head to The Beehive for a day of food, libations and live music. Father’s Day Brunch will be served from 10am-3pm, and Dads can indulge in an array of dishes like Skirt Steak & Eggs with Frites and Salad ($25), The Beehive Prime Burger with Frites & Slaw ($15) and Short Rib, Farmhouse Cheddar & Fontina Grilled Cheese ($15). Or, for those that prefer to celebrate with a night on the town, dinner will be served from 5pm-10pm, featuring options like “Fall-Off-The-Bone” Baby Back Ribs ($13) and Blackened NY Strip Steak Frites with Peppercorn Jus ($29). Dad can wash it all down with The Beehive Honey Brew ($5 12. oz/ $7.75 16 oz. ), a light pilsner with a local honey-infused finish, brewed only for The Beehive by the Cape Ann Brewing Company. Please call 617-423-0069 to make your reservation; both brunch and dinner reservations are highly recommended. 4) Chef Brian Poe (Poe’s Kitchen at the Rattlesnake), will soon bring the city another eatery: the Tip Tap Room. It is set to open in mid-June on Cambridge Street in Beacon Hill and – true to its namesake – will dish out a variety of inventive “tips” accompanied by an immense selection of beers on “tap” in an upscale pub setting. Culinary Concept: With its kitchen helmed by Chef Poe, the Tip Tap Room will be home to cuisine where the traditional meets the not-so-traditional. On the traditional side, Chef Poe will offer guests protein “tips” such as: Steak (house marinated, horseradish potatoes, cherry pepper & watercress slaw, bordelaise); Turkey (sage peppercorn marinated, cranberry fennel slaw, cornbread stuffing, creamed corn potatoes); Chicken (lemon, lime, orange, yuzu & herb marinated, rice, vegetables); and, Lamb (mint and shallot marinated, mint lamb glaze, chèvre mashed potatoes, sautee of greens, tzatziki). For those looking to take a walk on the wild side, Chef Poe will offer rotating, seasonal wild game “tips” such as: Elk (herb & shallot cedar plank elk, BBQ glaze, wild boar bacon & chive mashed potatoes); Yak (garlic & red pepper rubbed with fresh horseradish, shaved fennel, watercress & Meyer lemon slaw, parsnip & potato smash); Emu (beer & ginger marinated, summer peach & basil slaw); and, Goat (pistachio & ras el hanout dusted with pearl barley tabbouleh). Other non-traditional “tip” options will include: Swordfish (artichoke, olive tomato, bell pepper & parsley salsa, tapenade mashed potatoes, haricot vert, citrus & herb cream); Tofu (garlic roasted portobellos, roasted red pepper & seared avocado, upon spinach quinoa); Buffalo Top Round (peppercorn & coriander marinated, Great Hill blue mashers, bone marrow bordelaise); and, Dueling Beer Bellies (wild boar & pork belly braised in beer with candied boar bacon bits). Chef Poe’s signature tips are priced between $12 and $17. On the side, Chef Poe will offer a selection of fresh local produce and innovative starch options such as wild boar bacon & chive mashed potatoes. Priced between $9 and $13, appetizers include items such as: Cheese & Cracklins (fried goat cheese balls, duck fat fried prosciutto “cracklins,” grilled asparagus tips, carrot ginger dipping sauce); Rock Shrimp (katafi & nori fried shrimp, cucumber salad, chili ginger sauce; Fig (pancetta & blue cheese stuffed with burnt balsamic butter); and, Potato (seven bacon tips, beer cheese sauce, fried oysters, pickled Serrano pico). Gourmet salads (priced between $6 and $10 with the option to add a choice of tips for an additional charge) will also grace Chef Poe’s menu including: Grilled Baby Bok Choy (sautee of snap peas, Thai chilies, caramelized shiitakes, grilled tofu with sesame soy vinaigrette); and, Watermelon (arugula, shaved red onion, watermelon, black sesame seeds with toasted cumin cayenne vinaigrette). To end with something sweet, seasonal dessert options will be available including: Peach Tip Cobbler; and, Blackberry & White Chocolate Bread Pudding (with whiskey caramel). The Tip Tap Room will also open up its doors for brunch service each weekend. Justin Dalton-Ameen (Parish Café) will serve as the Director of Beverage Operations at the Tip Tap Room. With a beverage program heavily rooted in craft bourbons and 36 selections of beers on tap, Dalton-Ameen will closely manage products to ensure sophisticated yet approachable pairings with Chef Poe’s dishes. Dalton-Ameen has carefully researched beers with local ties, ones that possess domestic popularity, and others that are strong international imports to fill the coveted 36 taps at the Tip Tap Room. Local beers will account for 12-15 spots while domestic and import selections will line the others. The Tip Tap Room has a full liquor license and will boast 10-15 signature craft cocktails. At brunch service, the Tip Tap Room will also serve up specialty cocktails including twists on traditional mimosas and Bloody Marys. The Tip Tap Room will have a dining room seating 100 and an expansive bar and lounge area. The state-of-the-art open kitchen overlooks an expansive, black ash-stained “L” shaped bar with 17 individual seats. The Tip Tap Room is located at 138 Cambridge Street in Boston’s Beacon Hill neighborhood. The Tip Tap Room will be open daily from 11:30am through 1:30am and for brunch service on Saturday and Sunday from 11:30am through 1:30pm. Follow the Tip Tap Room’s latest developments on Twitter: @PoesTipTapRoom. 6) While every culture celebrates the coming of the summer solstice in their own way, in countries such as Sweden, Finland and Estonia, “Midsummer's Eve” is considered one of the greatest festivals of the year rivaling Christmas and New Year’s Eve. The celebration of the summer solstice predates Christianity and is celebrated with food, libations, activities and games including the traditional dance around the maypole. Join in the festivities at the Beacon Hill Hotel & Bistro as they commemorate the holiday through food & drink with their traditional “Midsommarmiddag” or “Midsummer Dinner” beginning Monday, June 18 and continuing until Sunday, June 24. Available 5:30pm-11pm (10pm on Sunday) for $47 per person, the traditional dinner will be a prix fixe menu and served in conjunction with the Bistro’s regular menu and dinner service. Reservations are recommended by calling 617-723-7575. "Chianti is simpler path of Sangiovese." Tomorrow, I fly off to Florence, Italy, the first stop on my journey to the Chianti Classico region of Tuscany. As part of a media trip, hosted by the Consorzio del Vino Chianti and Balzac Communications, I and four other writers will be exploring Chianti Classico during the Chianti Classico è, a ten day festival celebrating the wines and foods of this region. We will participate in some of the festival events while also visiting wineries and visiting other historic and interesting destinations. Even before the ancient Romans arrived in the Chianti region, the Etruscans, who called themselves the Rasenna, inhabited the area, growing vines and producing wine. After the Romans seized control of the region, there was a great demand for Italian wine though the Romans generally preferred the sweet southern wines over the drier wines of Tuscany. The Romans controlled this area for about 700 years. Wine making continued throughout the centuries, despite wars, plagues and other disasters. Tuscany is a historically rich area, and many famous personages lived in, passed through and/or enjoyed the Chianti region. From the famed poet Dante Aligheri to the extraordinary Leonardo da Vinci, from Amerigo Vespucci (where we derive the name America) to Giovanni da Verrazzano (the discoverer of Manhattan), from Galileo to Machiavelli. Michaelangelo was especially fond of Chianti, and presented some of their wines to the Pope as a gift. It will be amazing to follow in their footsteps through this intriguing area. It was not until the latter part of the 14th century, that the wines of this region became known as Chianti. Prior to that time, the red wines were usually called vermiglio and the white wines were known as vernaccia. It would not be until 1716 that the geographic region of Chianti would be officially established. Then, in 1924, a consortium was created to protect the name and identity of Chianti wine, choosing the Gallo Nero, the black rooster, as their symbol. Later, in 1932, the territorial lines were redrawn, and the Chianti Classico region was created. "The hills between Florence and Siena come as near to a poet's idea of gentlemanly country life as anywhere on earth." Some people still think of Chianti as a wine that comes in a straw basket, and which often end up as candle holders. That item originated during the 13th century, when the wines of Chianti started to be placed into a fiasco (a "flask"), a squat bottle inside a straw basket. Most modern producers no longer use the fiasco though a few still do and it was much more popular in the past. Interestingly, the term "fiasco" is used in other words too, such as fiaschetterie (wineshops). Today, the Chianti Classio region occupies about 175,000 acres with 18,000 acres of vineyards and 25,000 acres of olive trees. Olive oil is still a significant industry. In 2011, the region produced about 7.3 million gallons of wine. During the last couple years, sales of Chianti Classico have been increasing, mostly due to exports. For example, 2010 saw a 24% increase in sales over 2009 while 2011 saw a 4% rise in sales over 2010. About 78% of their production is exported and the U.S. is the prime market, purchasing about 28% of the production. Germany, Canada, the United Kingdom and Switzerland occupy the next export spots. Italy itself has been drinking less Chianti Classico, from 26% in 2009 down to 22% in 2011. During our journey, we will be visiting wineries including Castello d’Albola, Felsina, Castelli di Starda, Barone Ricasoli/Castello di Brolio, Isole e Olena (one of my favorite producers), Fontodi and Poggio al Sole. We will participate in festival events such as Gallo Nero (Black Rooster) & Street Food Festival and the Homemaker’s Trophy, a cook-off with local housewives. In addition, we will attend a few other tasting events, with the opportunity to taste many different wines from a variety of producers in the Chianti Classico region. I also look forward to the cuisine, La Cucina Povera Toscana, which has a strong peasant tradition. From bistecca alla fiorentina (a large and rare t-bone steak) to pecorino toscana, a mild sheep's milk cheese, from acquacotta, a very thick soup, to panforte, a Sienese cake. I want some of the "tuna" of Chianti, which is actually suckling pig. It is thought that in ancient times, authentic tuna was an expensive delicacy, and thus poorer individuals used pork instead, as a tuna substitute. You also have to love a region where a political party originates, fighting to ensure your steaks are properly large. In 1953, Corrado Tedeschi started the National Florentine Steak Party whose primary principle was that every person was entitled to 450 grams of steak per capita, though a kilo would be an even better portion. One of their slogans was "Better a steak today than an empire tomorrow." I won't be returning home until next Wednesday night, so will be online only sporadically. But hope to have plenty of great stories for when I return. As I mentioned in my Rant yesterday, I attended a "food pairing seminar" led by Drink Ribera, showcasing Spanish wines from the Ribera del Duero region. The event was held at Taberna de Haro, an excellent Spanish restaurant in Brookline. I had some concerns that the event would fail to reach its potential, that pairing Spanish wines with Spanish cuisine was too obvious a choice and that it would have been more educational if a different cuisine had been involved. That is largely what occurred. The "food pairing seminar" was actually more of a broad overview of the Ribera del Duero region and its wines. That was certainly educational, though not quite expected. For those unfamiliar with the wines of this excellent Spanish region, it was a great introduction. I was intrigued to learn that climate change has not been a major factor in this region as its higher altitude has minimized the effects of climate change. But I was hoping for a more in-depth discussion of the versatility and flexibility of these wines with a variety of different cuisines. The seminar included a pairing of three wines types, Joven, Crianza and Reserva, with three courses of Spanish dishes prepared by Chef/Owner Deborah Hansen. The brands of the wines were not identified so that we could concentrate on the style rather than the producer. The types are differentiated by their amount of aging. Thus, the Joven, with the least amount of aging, is more fresh and fruity while the Reserva, the longest aged, has more spice elements and the fruit notes are a bit more restrained. Much of our fare was simple yet fresh and delicious, the high quality cuisine that I have come to expect from Chef Hansen. Each of the three courses came with two dishes (or a bowl) of food. All of the dishes went well with the wines, though that was not really surprising, except for one of the first dishes. It is surprises like that first dish of which we needed more. To make Ribera del Duero wines more mainstream, they need to be presented in every day situations, with foods like pizza, burgers, steaks, pasta and even Chinese food. As I said previously, Drink Ribera should not have gone for the obvious, but rather used this opportunity to think outside the box and pair their wines with a much different cuisine. The first course, paired with the Joven, presented the only surprise of the event. Beside the spicy chorizo atop the country bread that was drizzled with olive oil, we also had "crashed" eggs, thinly sliced fried potatoes and jamon. Red wine with breakfast food? Yes, it worked, the fruitiness of the wine making a nice companion to the eggs, potato and ham. That is thinking outside of the box and I suspect that was due to Chef Hansen. This initial course also came with a bowl of simmered white beans with shreds of pork rib. The tender beans, savory broth and slightly salty pork combined for an excellent melange of flavors. It too went well with the young Joven wine. Maybe my favorite dish to the lunch was during the second course, pairing with a Crianza, the braised lamb with peppers and jamon. The chunks of lamb were extremely tender, easily flaking apart, and had such a savory taste, accented by the sauce. A hearty dish that satisfied the carnivore within me. This was also a perfect choice for the Crianza, which presented a bit of a more rustic style with added spice notes. With the lamb, we also had some morcilla (blood sausage) and oyster mushrooms with garlic. I do enjoy morcilla so this was a pleasant treat, and they certainly go well with a Spanish red wine. For the final course, we began with some roasted red peppers and Zamorano cheese topped by a couple Marcona almonds. Like Manchego, it is a hard, sheep's milk cheese but it has a more tart flavor, and was a touch creamy as well. The peppers seemed fresh, with a nice crispness still to them. The Reserva, with its Old World style, was a nice pairing. The braised hen with saffron, fresh thyme, and a pearl tomato was tender, moist and flavorful. The meat easily came apart and was not over powered by the Reserva wine. Another delightful dish. Kudos once again to Chef Hansen for a delicious meal, and I continue to heartily recommend that you check out her restaurant Taberna de Haro. As for more nontraditional pairings for Ribera del Duero wines, I will work on a future post to provide some suggestions. Today, I am attending a wine tasting and food pairing seminar led by Drink Ribera, showcasing Spanish wines from the Ribera del Duero region. As I love Spanish wines, I am very interested in this event and tasting some of the latest wines from this area. The event is being held at Taberna de Haro, an excellent Spanish restaurant in Brookline, and Chef/Owner Deborah Hansen is sure to create some delicious Spanish dishes to accompany the wine. But Drink Ribera has missed a significant opportunity, especially considering they are holding a food pairing seminar. They have gone with the obvious, failing to transform this event into a better learning experience. As the event is being held for trade and media, they are addressing a more knowledgeable audience, so there was really no need to go with the obvious. And this mistake is a common one, committed by a number of other regional wine tasting events. What is their error? Pairing regional wines with regional cuisine, and in this case specifically, pairing Spanish wines with Spanish dishes. Yes, that is of course a tasty food & wine pairing but it is also the most obvious choice. Who doesn't realize that Spanish wine and food go well together? The same applies to other regions as well, such as Italian wine pairing well with Italian cuisine, French wines with French fare, etc. It is a given that such pairings work and individuals in the wine trade should be even more than cognizant of such basic matters. At today's food pairing seminar, I will be extremely disappointed if they merely tell us how well Spanish wine pairs with Spanish food. I am hoping, and actually expect, that they will discuss the versatility of Spanish wine, how it pairs well with a wide variety of cuisines. If Drink Ribera hopes to spread a passion for their wines, they need to promote it as something more than just for Spanish cuisine. If consumers see such wine as restricted to Spanish food, then they are unlikely to make these wines a regular part of their lives. Now, even if Drink Ribera tells us how versatile their wines might be, they are not providing us the opportunity to actually experience that versatility. Instead, we are stuck with the obvious, Spanish food. I have no doubt the food will be tasty, but that is not the point. The point is they should be trying to expand our minds by actually showing us that the wines of Ribera del Duero can pair well with something else, like Italian or French cuisine, German or Asian dishes. This event should not have been held at a Spanish restaurant. This is not the first, and certainly won't be the last, regional wine tasting event that has gone for such an obvious pairing. I have previously attended events where Italian wines were presented at Italian restaurants, French wines with French dishes, etc. Though fun and pleasing to the palate, they also fail to educate as well as they could. They need to think out of the box, to consider more daring culinary pairings, to show the true versatility and flexibility of their wines. In some of the Sake events I have hosted, I have tried to do just that, such as pairing Sake with Italian cuisine, to show that Sake is more than just for sushi and Japanese dishes. People are open to such experiences, but someone needs to lead the way. If you keep pairing regional wines with their respective regional cuisines, then you are not leading people anywhere they have not already traveled. They would enjoy experimenting with other cuisine pairings, but wineries and regional wine organizations need to show them the possibilities. Forget the obvious and I bet your results will be much better. Sometimes on vacation I just want to enjoy a dinner out, to not take notes or photos of my meal. Yet sometimes that meal is so impressive that I still need to write about it, even though I can't provide as much detail as maybe I desire. The restaurant though should be recognized for its high quality, even if that mention is brief. While in Louisville, we dined out one evening with my friend Fred and his wife, selecting a restaurant that none of us had ever been to before. We took a chance, dining at Harvest, a "locally grown restaurant," situated in the downtown NuLu district of East Market Street in Louisville. Led by Chef Coby Ming, their concept is compelling: "Our philosophy is very simple – to produce outstanding, regionally inspired, seasonal cuisine from the freshest and finest local produce in a casual fine dining setting. This is something that we are very passionate about and we are truly grateful to the community for supporting our locally grown ‘farm-to-table’ vision." As for specifics, they pledge to source at least 80% of their food from farmers and growers within a 100-mile radius of the city. The farmers must be "...committed to sustainable farming practices and impeccable standards of animal welfare." Adorning the walls of the interior of the restaurant, you will find large photos of the farmers they rely upon. The dominance of those photos is appealing. They carry numerous craft beers, including local ones, as well as plenty of different bourbons. For their cocktails, they use seasonal local ingredients and also craft many of their own bitters, syrups, and tinctures. Their wine list did not possess any local Kentucky wines but the list is interesting, with an intriguing and diverse selection of wines from across the world. We chose to drink a 2009 Eyrie Vineyards Pinot Noir ($78), an excellent Oregonian Pinot, priced at about twice the usual retail. The dinner menu is essentially divided into Starters (about 8 choices from $6-$13) and Entrees (about 8 choices from $12-$19) with some daily specials. Many of the choices have a southern flair, showing some good creativity. The selection is diverse enough for both carnivores and vegetarians. We began with the Daily Bread Board ($6), which were warm zucchini rolls and though I am not usually a fan of zucchini, these were quite tasty. A nice herbal taste, fluffy in texture with a crisp exterior. The Cheese Board ($13) with sweet pickled onion jam, peach butter, and crostini had local Kentucky cheeses, all three which were excellent, including a delightful and subtle blue cheese. My Salad ($10) contained house greens, asiago crisp, sunny side egg, pretzel crostini, and cracklins, topped by a spicy basil vinaigrette. An excellent blend of flavors and textures. For my entree, I opted for the Buttermilk Fried Chicken ($19) with a chive hoecake and topped by a smoked peppercorn gravy. Moist, tender white meat chicken with a crispy, flavorful coating and a light and smoky gravy. An excellent fried chicken which should please anyone, and which satisfied me. I also got to taste the Crispy Pork Confit ($17) with pickled jalapeño-bacon grits, honey glazed vegetables, and a smoked onion jus. The pork was meaty and tender too, and the grits were especially intriguing, with a spicy kick to them. For dessert, I had an amazing Bourbon Bread Pudding, which was piping hot, and bursting with flavor. The textures and tastes worked harmoniously and it was a decadent pleasure. One of the best bread puddings I have tasted in quite some time, and it is worth going to Harvest just for this dessert. Service was very good, personable and attentive. Their philosophy is compelling, the food is tasty and prices are reasonable. I give Harvest a strong recommendation and would definitely return the next time I visit Louisville. After a long, fun and exciting day at the Kentucky Derby, the first time I had ever attended that grand event, we all traveled to a local restaurant, Corbett's, for dinner. My good friend Fred had chosen the venue, making reservations months before, and it offered a special Derby prix-fixe menu. Fred had also arranged for wine pairings with our dinner. The restaurant was opened in December 2007 by Chef S. Dean Corbett. It is housed in a beautiful mansion, which was constructed in 1850, and we sat in one of the lower levels, a semi-private room which was elegant without being pretentious. Overall, we had a superb experience, with delicious and creative food and some intriguing and tasty wines. I would give Corbett's a hearty recommendation, especially considering how well everything went despite the fact the restaurant was well packed with Derby goers. We began our dinner with flutes of Charles Ellner Cuvee de Reserve Brut Champagne, a delicious Champagne with lots of fruit and floral notes. A nice start to the evening. As an amuse-bouche, we received a Smoked Salmon Parfait with Baesetra Caviar, Creme Fraiche, and Essence of Dill. Lots of creaminess, briny notes, and bursting with flavor. For our appetizer, our dish presented a Diver Scallop atop Lobster thermidor with a Gruyere Crisp and Red Mustard Demi-Glace. Perfectly seared, the scallop was tender and moist, and the thermidor was flaky with sweet lobster meat. And who wouldn't enjoy a crisp of gruyere? Our next wine was the 2008 Fontina Candida Luna Mater, Frascati Superiore, a blend of 50% Malvasia di Candia, 20% Malvasia del Lazio, 10% Greco, 10% Bombino and 10% Trebbiano. An amazing white wine, full bodied with intense flavors of pear, orange, herbs, and mild spices. Complex and intriguing, a wine I want to seek out to fill my cellar. For a Salad, we had Mache, Compressed Watermelon, Jicama, Radish, Capriole Farm's Goat Cheese, and Pignoli topped by a Cilantro Vinaigrette. Everything was very fresh, with a nice contrast of sweet and bitter, crisp and creamy. The 2009 Domaine Roger Lassarat Close De France Pouilly-Fuisse was a very pleasant Chardonnay, with a restrained but noticeable use of oak. The oak served more as an accent than the dominant flavor of the wine. Next up was a dish of Mero Sea Bass accompanied by Artichoke & Country Ham Ravioli, Morels, Fava Beans, Basil Sauternes, and a Charred Tomato Sabayon. A savory, tender fish was complemented by the light sauce and even the ravioli appealed to me though I am usually not an artichoke fan. Once again, all of the elements of this dish worked well together. As an intermezzo, there was a refreshing Yuzu Gelee with Meyer Lemon Sorbet. The 2006 Poderi Elia Barberesco Serracapelli was an approachable and delicious Italian red with black cherry, plum, vanilla, and mild spice notes. Tannins were moderate and the finish was lengthy and pleasing. The Creekstone Tenderloin with Lyonnaise Pommes Anna, Carrot Flan, Beet Coulis, Gary Farms Mustard Greens, and Sauce Perigueux was our final entree. The beef was very tender and the sauce enhanced the flavor of the meat. The potatoes and flan were both quite delicious, and it was another well balanced plate. The only course which didn't really impress me was dessert, a Bittersweet Chocolate & Bourbon Bread Pudding with Sea Salt Caramel Sauce, Local Strawberries, and Frozen Rhubarb. This was really not my idea of a bread pudding, and was more like a dense cake or brownie. The flavors were good, I just found it difficult to consider it as a bread pudding, especially as I previously had such a fantastic bread pudding at another Louisville restaurant. Though kudos to the pairing of a 20 Year Old Port with this chocolate dessert. Overall, the restaurant, dinner and wines impressed me. The sommelier, Troy Ritchie, did an excellent job of selecting the wines to accompany our meal, and our servers, Erin and Cecelia, were professional and attentive. I would love to try this restaurant another time for their regular menu, and recommend that if you are in Louisville, Kentucky, to check out Corbett's. As I mentioned previously, most bourbons are blends, and that applies even to "Straight" bourbons. How can that be so? Though it may seem confusing, it really is not. Legally, a straight bourbon cannot have any additional flavors, colorings or other additives added to it. But, you can still blend bourbons from different barrels, as long as no additional items have been added to any of those bourbons. So the "straight" refers more to its purity rather than whether it is blended with other bourbons or not. Two relatively new terms you may see on a bourbon label are "single barrel" and "small batch." Neither has a legal definition though basic definitions can be ascertained. A "single barrel" derives from a single barrel of bourbon, which has not been blended with any other barrel. Thus, there is a very limited amount of that bourbon available. As it is a single barrel, its flavor profile will be unique, and may bear slight differences from other bourbons from the same distillery. A "small batch" means a bourbon that has been blended from a small number of barrels, though that number will vary from distillery to distillery. It is supposed to provide a better and more unique product, though more of it is usually available than a single barrel. If you order bourbon at a restaurant or bar, you have several choices as to how it will be served. You might choose a bourbon cocktail, such as a Bourbon Manhattan or a Mint Julep. For high end bourbons, you might prefer to have it "neat," meaning that it is served at room temperature without any ice or other accompaniments. Just you and your bourbon, an intimate relationship. Instead, you could order it "straight up" which often means the bourbon has been chilled with ice, either shaken or stirred, and then strained into a glass. Though note that some places consider "straight up" to be the same as "neat." If in doubt, explain your desire. Finally, you can have it "on the rocks," a glass of bourbon with ice in it. Much of the bourbon you find will generally be 80-100 proof, which is a significant amount of alcohol so you always should take care when drinking it. You can even find some bourbons that are over 100 proof, though those are rarer. When tasting bourbon, you will usually note the heat and burn from the alcohol, and the amount of such will vary from bourbon to bourbon. Though few talk about it, that heat and burn are a major element of bourbon, and one you must come to grips with if you desire to appreciate bourbon. It can be disconcerting to someone who has little experience tasting spirits. So either learn to adapt, or you may want to choose another beverage. During my time in Louisville, I managed a taste a fair amount of bourbons, most neat, especially some of the higher end offerings. Many places offer bourbon flights so you can try three different bourbons at once, sometimes in half ounce pours, which are a nice size for tasting. The flights often have themes, and allow you to compare and contrast similar bourbons. The first bourbon I tasted on my journey was the Elmer T. Lee Single Barrel Kentucky Straight Bourbon (90 proof) and it set the bar high for the rest to come. Incredibly smooth, with a complex melange of vanilla, honey, butterscotch, dried fruit and mild spice notes. A great sipping bourbon, and I brought a bottle back home with me. The Blanton's Single Barrel Bourbon (93 proof) was also very smooth, though less sweet than the Elmer T. The vanilla notes were subdued and there was more of a citrus profile, with nutty hints. Excellent for sipping, especially if you want something a bit less sweet. The Old Rip Van Winkle Distillery produces some of the most expensive and most sought after bourbons. They can be very difficult to find, and most places sell out of them as soon as they arrive. At the Limestone restaurant, I had a flight which included the Van Winkle Special Reserve (12 years old, 90.4 proof), the Pappy Van Winkle's Family Reserve (15 years old, 107 proof) and the Pappy Van Winkle's Family Reserve (20 years old, 90.4 proof). The Van Winkle portfolio also includes a 23 year old Reserve. All three were very different from each other, and the 12 year old seemed to be a smoky version, with burnt caramel and vanilla notes. The 15 year old was all about the spice, with an intriguing complexity, one to slowly savor after dinner, marveling at everything to be found within your glass. The 20 year old went more for subtlety, equally as complex but more subdued, more of a contemplative bourbon. Well balanced, interesting and compelling. At the Jockey Silks Bourbon Bar, which has a superb selection of bourbons, I tasted numerous interesting bourbons. The Eagle Rare Antique (17 years old, 90 proof) was silky smooth with a delicious palate of caramel, honey, tea, vanilla and cinnamon. The Hancock Reserve was very different with an unusual herbal/spice flavor that I could not identify. I am indecisive whether I liked the flavor or not, but it was very different. The Bookers 121.4, produced by Jim Beam, may have a high alcohol content, but it is not really noticeable as such, with its combination of smoke and spice and hints of other flavors permeating this fascinating bourbon. The Elijah Craig 18 Year Old was exceptional, an alluring bourbon with rich depths of flavor and complexity. It seduced my palate, making me crave even more. The Woodford Reserve Double Oaked is unusual in that the bourbon is finished in a special, second white oak barrel that has been heavily toasted but with a minimum char. This did give the bourbon a more toasty profile, with plenty of spices and herbal notes. The 2011 Old Forester Birthday is another unique bourbon, vintage dated from a specific date of production. It was bold and spicy, with very subdued, almost elusive, notes of vanilla and dried fruits. Bourbon even has its own holiday now, and not just a single day. In August 2007, the U.S. Senate passed a resolution, sponsored by Senator Jim Bunning (R-KY), that declared September 2007 to be "National Bourbon Heritage Month." A similar resolution has passed each subsequent year so we can look forward to September 2012 being another National Bourbon Heritage Month. But please don't wait until September to explore bourbon. Get out there and learn more about it, taste a bunch of bourbons, use it in cocktails, and use it in recipes. You will find plenty of diversity in bourbon, and it is a versatile alcohol. Expand your palate and enjoy a fine Kentucky made bourbon. I am back again with a new edition of Thursday Sips & Nibbles, my regular column where I briefly highlight some interesting wine and food items that I have encountered recently. 2) AKA Bistro in Lincoln, one of my favorite restaurants, is gearing up for the Spring. * Hamachi Sashimi Yellow. They adorn it with a creamy ginger vinaigrette, sea grapes and unique pressed yozu pineapple. AKA has recently added a number of new Sakes to their list, such as the Sato No Homare (Pride of the Village) for $10/glass and the Hakushika Yamadanishiki for $6/glass. The Sato No Homare is a favorite of mine, made in a sake brewery that is over 860 years old! What a taste of history. Chariot de Fromage: Six or eight cheeses, at peak ripeness from The Concord Cheese Shop, are offered by the slice on Thursdays from 6-9 PM. Ask their cheesemonger Brie Hurd to describe the provenance and taste of each before deciding. The “Teriyaki for Two” Chef’s Special Menu is available during normal operating hours. It costs $45 (excluding tax and gratuity). 4) As a result of a United Nations General Assembly resolution that passed in 2008, June 8 officially marks our planet’s biggest celebration of the ocean: “World Oceans Day.” On June 5, from 6pm-8pm, Legal Harborside will team up with The Nature Conservancy a few days early to celebrate “World Oceans Day” with a fundraising evening hosted on the rooftop lounge, brimming with local seafood and signature cocktails while overlooking Boston Harbor. Supporters will indulge in a raw bar – filled with a variety of oysters, littlenecks and smoked salmon – and Legal Sea Foods’ signature New England Clam Chowder. Legal Harborside will also serve up complimentary beer, wine and an exclusively themed Ocean Breeze cocktail. The only conservation organization working on marine issues in all U.S. coastal states and territories plus an additional 30 countries, The Nature Conservancy partners with fishermen to protect New England’s fisheries for the sake of healthy oceans and economically healthy coastal communities. Through 50 years of work in Massachusetts, The Nature Conservancy has protected more than 23,000 acres of important habitat from the coast to the mountains. Bourbon permeates the history, culture and economy of Kentucky. You can travel the Kentucky Bourbon Trail, visiting distilleries, or walk the Urban Bourbon Trail, stopping at a number of Louisville restaurants and bars. Approximately 1.7 million people have visited one of their bourbon distilleries during the last five years. Most restaurants and bars carry a good selection of bourbons, some as many as 150. Various restaurants cook with bourbon, from appetizers to desserts, from breakfast to dinner. Numerous stores sell food products made with bourbon, including candies (like bourbon balls), hot sauces, syrups, jellys, jams and much more. Many thousands of people are employed by the distilleries and tangential industries. When I visited Louisville, it seemed like I could not avoid the influence of bourbon, not that I wanted to in the first place. I took the opportunity to visit a couple of distilleries, to meet some of the distillers, and to taste a variety of different bourbons, including many that I have not tasted before. I ate various dishes that used bourbon, from barbecue sauces to bread puddings. I expanded my knowledge and experience with bourbon, and I was in the perfect place to do so, especially accompanied by my bourbon knowledgeable friend Fred. So let me share some basic information about bourbon, hopefully to give my readers a better understanding and appreciation of this American spirit. I also hope that this brief introduction to bourbon motivates you to learn even more about it. The economic importance of bourbon cannot be underestimated. A recent report, The Economic and Fiscal Impacts of the Distilling Industry in Kentucky (January 2012) was prepared for the Kentucky Distiller's Association and discussed the extent of the bourbon industry and its statistics indicate the vast importance of bourbon to Kentucky. Nineteen major distilling establishments exist in Kentucky and another twelve craft distilleries have recently been licensed or are in the process of obtaining one. Kentucky bourbon accounts for about 35% of the value of all distilled spirits produced in the U.S. One state accounting for about 1/3 of the value of distilled products. Kentucky also possesses about 43% of all distilling jobs in the U.S., employing around 10,000 people. California may dominate the U.S. wine industry but Kentucky dominates spirits. Kentucky ships about 10 million cases of bourbon throughout the U.S. and exports another 28.7 million proof-gallons to about 126 countries. Total Kentucky shipments account for approximately $2.5 billion. Kentucky bourbon is the largest category of exported U.S. distilled spirits, accounting for 28.7 of the 61.5 million proof gallons shipped in 2010, or put another way, bourbon accounts for $768 million of the total value of $1,157 million in distilled spirits exports. Who imports the most bourbon? About 73% of the exports are sent to Germany, Australia, United Kingdom, Japan, New Zealand, and France. It is also fascinating that 56% of the exports are in bulk, rather than bottled, especially to Australia and New Zealand. It is thought that it is more cost effective to ship the bourbon in this method. How did bourbon originate? Bourbon is a type of whiskey, a distillation of a fermented mash of grain, so it is important to briefly consider some of the history of whiskey in the U.S. Prior to the American Revolution, the production of whiskey was very small, with rum production being far more significant. Yet that reversed itself after the Revolution, and rye whiskey probably was the first type of whiskey to dominate. Whiskey would sometimes be used as form of currency, often in bartering and the government even used it as partial payment for their soldiers. In 1781 in Kentucky, taverns began to regulate the sale of whiskey by the drink and whiskey stills were being offered for sale in 1787. By 1791, distilling started to go hand and hand with farming, an additional method of income with their crops and livestock. Interestingly, in 1798, George Washington became the country's largest distiller, making 11,000 gallons of whiskey at Mount Vernon. At some time in the late 18th century, bourbon began to be produced but its exact origin is unknown although there are several claimants alleged to be the inventor, from a Baptist minister named Elijah Craig to a distiller named Jacob Spears. Thought these legends are popular, and often disseminated in books and articles, the evidence for them is usually weak. We may actually never know the true origin. We do know that as whiskey can be made from a number of grains, distillers in Kentucky soon learned that corn, which grew very well in their fields, could produce an intriguing and tasty product. So multiple individuals may have created corn whiskies and it would be probably be impossible to say who was first. Whiskey proved popular for breakfast. A southerner might be known as a "slinger," someone who started their morning with sour mash, mint and sugar, almost like a julep. There is an old Kentucky saying that "three slings and a chaw of tobbaco" made for a "breakfast of champions." That is certainly an interesting way to start one's day. Though it is sometimes claimed that bourbon was declared by Congress to be "America's Native Spirit," that is not quite accurate. In 1964, Congress passed a resolution, stating bourbon was a "distinctive product of the U.S." granting the term legal protection. This is akin to the protection granted to wine terms like Champagne, Sherry and Port. Thus, bourbon can only be legally produced in the U.S.
What some people do not realize is that despite the fact that over 95% of all bourbon is made in Kentucky, about 255 different brands, bourbon can be legally made in any U.S. state. You can find small bourbon distilleries in places like New York, Indiana, Utah, Wisconsin and Missouri. Kentucky possesses about 5.2 million barrels of aging bourbon and whiskey, the clear leader in bourbon production. What legally constitutes a bourbon? According to the Federal Standards of Identity for Distilled Spirits, 27 C.F.R. 5.22(b)(1)(i), there are several basic, legal requirements for a spirit to be declared a "bourbon." First, it must be produced from a fermented mash of at least 51% corn. Second, it must be distilled at not more than 160 proof. Third, the final product cannot be more than 125 proof. Fourth, it must be aged in charred, new oak containers. According to 27 C.F.R. 5.22(b)(1)(iii), there are additional requirements for a product to be declared a "straight bourbon." First, it must be aged in charred, new oak containers for at least two years. Second, no additional flavors, colorings or other additives are permitted to be added to the bourbon. So in many respects it is more of a natural product, which should appeal to those concerned about extra chemicals in their food and drink. On the other hand, a "blended bourbon" may contain additional flavors, colorings or other additives. Bourbon is basically made from grains, yeast and water, and at least 51% of those grains must be corn. The other grains are usually rye, wheat and/or malted barley. A bourbon's grain recipe is known as its mashbill, and it will vary from distillery to distillery, brand to brand. Some are very secretive about the composition of their mashbill while others freely discuss it. The composition of that mashbill will partially dictate the flavor profile of the bourbon, such as making it sweeter or spicier, dependent on which grains are more prominent. Most distilleries use a single yeast for all their products, though Four Roses is unique in that it uses five different, proprietary yeasts. Most Kentucky water is excellent for making bourbon, being limestone filtered water which eliminates most of the iron which would adversely affect production. Local river water is used by some bourbon distilleries, and may still undergo further filtration. The quality of their water is one factor why Kentucky does so well with bourbon. As I mentioned, the grains create some of the flavors in the bourbon. Corn provides a distinctive flavor to bourbon, as well as some sweetness and a full body. Malted barley primarily provides the necessary enzymes to convert starches into sugars, but adds some flavors too, such as malt and chocolate. Rye and wheat contribute the most to the flavor with rye bringing spice notes while wheat creating a sweeter taste. Barrel aging will then contribute more elements to the flavor of the bourbon, as well as all its color. As the Federal regulations state, bourbon must be aged in charred, new oak containers. But many people seem to misunderstand this requirement, and you will even find some bourbon writers getting it wrong. At one bourbon distillery, their educational video for visitors even made an error about this requirement. Some state that American oak and/or white oak must be used, but neither of these is true. Any type of oak is permitted, including French or even Mongolian oak. American white oak is the primary oak of choice as many consider it the best for imparting its flavors to the bourbon. White oak is also plentiful and dense enough that the filled barrels won't leak but not so dense that the liquid cannot soak into the wood. Some distilleries, such as Buffalo Trace, have and continue to experiment with other types of oak. It is required that the oak barrels be charred though the exact origin of charring barrels is unknown, with a number of competing origin stories. The amount of charring of the oak can vary from producer to producer, and there is no legal requirement for a specific amount of charring. It seems that a #3 medium char and a #4 heavy char are common, though you will find barrels that are even as high as a #7 heavy char. When a barrel is charred, the natural sugars in the oak move toward the damaged area, and you will then eventually find a layer of caramelized sugars at the point where the char ends and the wood begins. This is known as the "red line" and is very important to the maturation process. When the temperatures around the barrel are high, the liquid inside will expand into the wood, passing through the red line and acquiring color and flavors from the wood. Once the temperatures get cooler, the liquid then retracts, bringing with it those colors and flavors. Over time, this expansion and contraction occurs many times, maturing the liquid and creating bourbon. Thus, the temperatures cannot remain constant as that would not allow the necessary expansions and contractions. As Kentucky has seasonal temperature extremes, the land is excellent for proper barrel maturation. It is often said that a barrel rounds off the rough edges of the bourbon, and it will impart a range of flavors such as caramel, ginger, maple, nuts, vanilla and more. Bourbons that have aged in the barrel for more than 6 years generally acquire bold vanilla flavors while younger bourbons have more citrus notes. Each barrel is unique though, and will impart its own specific flavor profile to a bourbon. That is why single barrel bourbons are more unique, as the flavor from one barrel will vary a bit from that of another. As most bourbons are blends, the distillers can create a consistent product, simply varying the blend as necessary. You should realize too that a bourbon cannot continue to mature forever in a barrel. There is a specific time when the maturation begins to adversely affect the bourbon, making it taste woody, though that time will vary. I have seen bourbons matured as long as 23 years in the barrel, and some longer may exist, but it is rare. The distiller needs to carefully assess aging bourbons, to ensure they have not started a downward spiral from over maturation. Barrels are generally stored in rack houses, also known as rick houses, barrel houses, or simply warehouses. A traditional rack house has five to nine stories, and the bourbon on different stories will mature at different rates due to temperature variations, as the higher stories generally have more heat. Some distilleries thus rotate their barrels to try to obtain a more even maturation, while others simply wait to blend the bourbons at a later time. The Four Roses distillery is an exception as they maintain only one story rack houses, so that their bourbon barrels all mature at an even pace. Barrel maturation also involves evaporation, the so-called angel's share. Each year, about 4% of a barrel evaporates, and curiously sometimes more alcohol is taken than water. One never knows which of the two will evaporate more. So a bourbon barrel can gain or lose alcohol content over time. The longer bourbon is aged in the barrel, the more of that bourbon that will be lost to evaporation, which is part of the reason why it is more expensive. I first came across The Drops of God in a jdrama site while doing my usual rounds of monthly marathons. Basically, the drama came first with me and not the manga (Japanese word for “comics”). It did help that the one who played the protagonist, Kanzaki Shizuku, happened to be my all-time favorite Japanese actor in the person of certified Johnny’s “aidoru” Kamenashi Kazuya. So to be honest, I watched the drama because of my fangirl instincts. However, I was in for a very pleasant surprise. I never did imagine that a drama series could get me hooked on wine this much. Not that I dislike wine! I’m a wine lover myself, though I probably don’t indulge in it as much as other certified connoisseurs. But Kami no Shizuku (the Japanese title for Drops) opened my eyes and specifically my taste buds to a whole new level of wine appreciation. The drama got me so hooked that when the short thirteen episode series was over, I moved on to read the manga. This only made me appreciate the series even more and proves another point. As an old generation otaku, I have always adhered to the belief that no matter how good the animated series is (anime, for brevity), the manga will always come across as the better version. This is only understandable since most animes come from celebrated mangas that have become so popular they need a wider audience to cater to. The same goes true for drama series as against their original manga stories. Case in point: Kami no Shizuku. The drama series ended too soon for me, especially since the manga hasn’t even reached halfway yet. And that’s not just what makes the manga the more superior version. 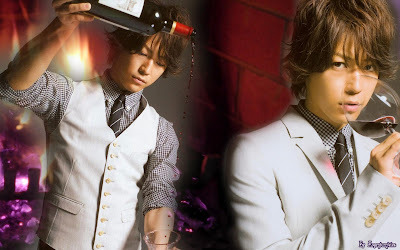 In the drama series, they performed most of the tasting rounds in an elegant wine cellar in Shizuku’s home. There, both competitors try to describe as closely as possible each Apostle to match the late Kanzaki Yutaka’s description of the wine in his will. 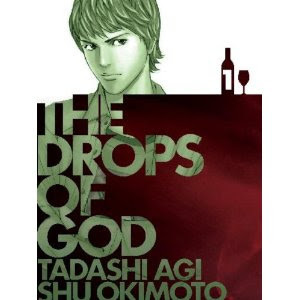 While the drama provided so many beautiful imagery as each Apostle is being revealed, I found the manga to have given a more soulful description of the wines. For example, the first wine introduced in the manga was a 99 Richebourge. It was depicted in the manga as the “fragrance of 100 flowers” with scenes from fields teeming with gorgeous colored blossoms. However, this was only after Shizuku got the wine to “open up” with his incredible decanting skills (So I learned what the art of decanting was really like here to!). It was also revealed that Shizuku never actually drank wine despite his uncanny abilities. He went on a rebellious streak in the past against his late father whom he claimed to be so obsessed with nothing but wine he forgot about more important things like his family. But here’s the big thumbs-up to both the drama and the manga: both have managed to capture beautifully the development of Shizuku’s character specifically his attitude towards wine. The uncovering of the mystery wines was later on shown to be actually a journey for Shizuku to unearth his father’s true feelings for him. Naturally, the series ended it on a high note but as the manga is still ongoing, spoilers at this point would be very thoughtless, especially to those following the manga faithfully. 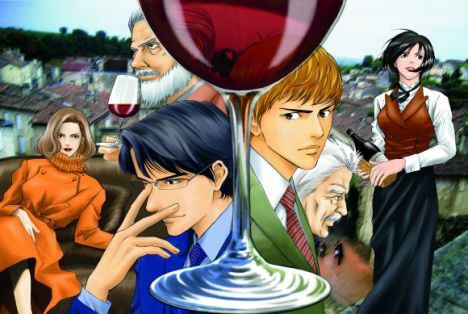 Nonetheless, both the manga and the drama series come highly recommended particularly to true-blooded connoisseurs and wine cellar enthusiasts out there. From the wine rack down to the bottle and the glass, The Drops of God weaves a spellbinding tale revolving on the passion for wine, for family, and for friendship. Thanks to Richard of Passionate Foodie and a fellow Drops of God follower for allowing me to make this article especially for his blog. We’re both waiting for the final round in the manga to be completed and while the competition between Shizuku and Issei is still hot, we suggest you guys join us and pay catch up! Or, you can try the series in the meantime as well. Either way, this is one work of fiction that will certainly tickle your wine-drenched taste buds! Cynette Lovelyn M. Montoya is a Content Writer at Wine Cellar Innovations and enjoys writing anything and everything about great wine and wine cellars. She is a huge fan of Japanese manga and anime, specifically Kami no Shizuku and other food and wine-themed manga. Rant: Why Do You Call Yourself A CSW? On Twitter, you will find some wine people using the initials "CSW" (Certified Specialist of Wine) after their name. You can also find some wine blogs where that certification is given a very prominent position on the front page of their site. The certification sounds very impressive, providing an appearance of credibility, an assumed warranty of wine knowledge. But what does being a CSW actually entail? Should readers view this designation as a guarantee of reliability? I am certainly in favor of wine writers attaining certifications, which I see as a way for writers to expand their own knowledge. I don't see it as a necessity but more a strong recommendation, a way to challenge yourself and expand your mind. I have received a few certifications myself, choosing certifications that allow me a more in-depth study of specific topics, such as Spanish wines, Champagne, Port and Sake. In addition, I believe certifications are merely an additional step in a greater learning process. There is always much more to learn and writers, in all fields, should continue to accumulate knowledge and experience. The Society of Wine Educators is responsible for the Certified Specialist of Wine (CSW) certification, which consists of a self-study course and exam. There are no classes a person needs to attend, no instructor to guide your education. The exam consists of 100 multiple-choice questions and you have one hour to complete it. You only need to score at least 75% to receive your certification. Personally, I don't consider that to be a particularly difficult burden. It is all multiple choice and there is no tasting element. And 75% would usually be a "C" in any school course, passing but not particularly impressive. The exam covers a wide range of topics, including: "Physiology of Taste, Wine Composition & Chemistry; Faults; Viticulture & Enology; Labels, Laws & Wine Regions; The U.S. Wine Industry; Wine's Contribution to Health; Wine Etiquette & Service; Food & Wine Pairing; and Responsible Beverage Alcohol Service." Wine Regions occupy the majority of questions, from 12 questions on France to 3 questions on South Africa. Frankly, this wide extent of coverage should be considered more of a Generalist than a Specialist. So, the proper designation should be a CGW (Certified Generalist of Wine) rather than a CSW. You can't really be a specialist of all wine, as there is far too much information for any single person to know. And the small amount of questions for each wine region do not provide sufficient evidence of a specialized knowledge of that region. Thus, the CSW designation is not really accurate, and the general public is misled as to the true extent of the certification. I also consider a CSW certification to be more of an introductory education, and not something indicative of advanced knowledge of wine. It is more of a wine overview than an immersive depth of understanding. So I don't understand a desire to use the initials after someone's name. In some respects, it seems like it could be a sign of insecurity, trying to convince people of your wine knowledge with some initials rather than showing your knowledge in your writing. For some, it might seem pretentious twaddle. A PhD or JD after your name is indicative of a true achievement, of rigorous education and testing. For wine, a MW (Master of Wine), is also indicative of a similar effort and achievement, a worthy addition to one's name. But a CSW doesn't carry a similar cachet. Even if you are able to add the initials to your name, that doesn't mean you have to do so, or even should do so. Ask yourself why you use those initials and explore your motivation. Is it really necessary? I don't think so. While driving through Louisville, Kentucky, you can't miss the ubiquitous fast food restaurants, a plethora of spots from McDonald's to Big Boy, Arby's to Wendy's. Louisville is also the home of Kentucky Fried Chicken, Pizza Hut and Taco Bell. If you don't want to eat at any of these spots, but still desire a quick meal, what can you do? Well, there are options if you know about them, or get lucky and just happen upon them. As I sought a spot for lunch, I spied the sign for Bluegrass Burgers and decided to give it a try. I knew nothing about the place but hoped it might have a decent burger. I was very fortunate in my choice as it turned out to be quite a find, a restaurant deserving of an hearty recommendation. Very good food, mostly local ingredients, and reasonable prices. A trifecta of benefits. The restaurant has been open for about a year and has a limited, but diverse menu. They pride themselves in serving mostly local ingredients, from their meats to their produce. They also have numerous vegan, vegetarian and gluten-free options. This is a very appealing philosophy and already elevates the place above many other fast food joints. Though the ultimate test comes down to whether the food tastes good or not. And in that respect, they also pass very easily. Much of the menu consists of sandwiches such as Kentucky Grass Fed Black Angus Beef Burger, Bison Burger, and Cheese Steak. You will also find Grilled Ahi Tuna Steak, Garden Burger, House Made Black Bean Burger, All Natural Grilled Chicken, All Beef Frank, and Marinated Portabello Mushroom. Each item costs $5.99-$8.99, and is accompanied with a side of hand-cut fries or house made cole slaw. You can get an extra burger for $3 for extra burger and some toppings cost 50 cents, such as cheese, chili, and bacon. For $1.00, you can get local artisan cheese from Kenny's Farmhouse Cheese. There is also a local produce bar which contains numerous free condiments, pickles and such. Sides includes fries, sweet potato fries, onion rings, coleslaw and salads. This is the Kentucky Grass Fed Black Angus Beef Burger, topped by local white cheddar and accompanied by hand-cut fries. The burger was juicy and flavorful, with a soft bun and crisp fries. It seemed like a hand-made patty and was certainly good-sized for the price. The cheddar was delicious too, adding a nice sharpness to the burger. This is the Kentucky Grass Fed Bison Burger with an extra patty and topped by local Bleu-Gouda cheese and accompanied by sweet potato fries. This was also excellent, moist with plenty of tasty flavor and the cheese added an intriguing and compelling element. The sweet potato fries were also addictive, with a bright sweet potato flavor and a crisp exterior. That would handle any appetite. Service was quick and pleasant, and we sat at a window counter, though there were also several tables where you could dine. Stumbling upon this place was great luck and I would return there anytime I went back to Louisville. Now why can't we find more places like this in Massachusetts?